Young Justice - "Independence Day"
Young Justice debuts tonight on Cartoon Network at 7 p.m. Eastern. Comic book cartoons have come a long way since Superfriends. At some point the people in charge of green-lighting animated superhero series realized that folks other than young children were watching and that kids themselves can handle a good story and interesting characters. The best example of the genre is Justice League/Justice League Unlimited, part of the DC Animated Universe, which managed to create a fully realized fictional universe with a huge cast of well-drawn characters. Young Justice, the latest series featuring DC's stable of heroes, is not as good as JL/JLU, but it's still entertaining superhero fare. Tonight's one-hour preview movie Young Justice: Independence Day begins with various heroes and their sidekicks repelling attacks by assorted ice villains. The kids are impatient because "today's the day" that they finally get to see the inside of the Hall of Justice, which we know because the sidekicks keep saying "today's the day." Upon arrival, they discover that the grown-ups haven't told them that the real Hall is a satellite orbiting the Earth; the building they're in is just a front for tourists. Two emergencies are announced, the League heads out to tackle one of them and tells the young'uns to stay put, so, of course, they disobey and wind up getting into trouble, uncovering a big secret, and fighting armies of mutants in several well-staged action sequences. The other characters are closer to what we've seen before, although this Robin spends more time fighting with a virtual keyboard that pops up from his arm than he does punching bad guys. Kid Flash is the dopiest and most inexperienced of the bunch; he actually loses his footing running up a wall, which was amusing. Speedy's anger is consistent with his appearance in other stories (although I doubt we'll ever see him shooting up heroin on this show), and Batman is menacingly monosyllabic. The basic premise—young heroes developing under the tutelage of the old guys—has potential, although this first pair of episodes spends a little too much time on the story and not enough on sidekick/mentor tensions. 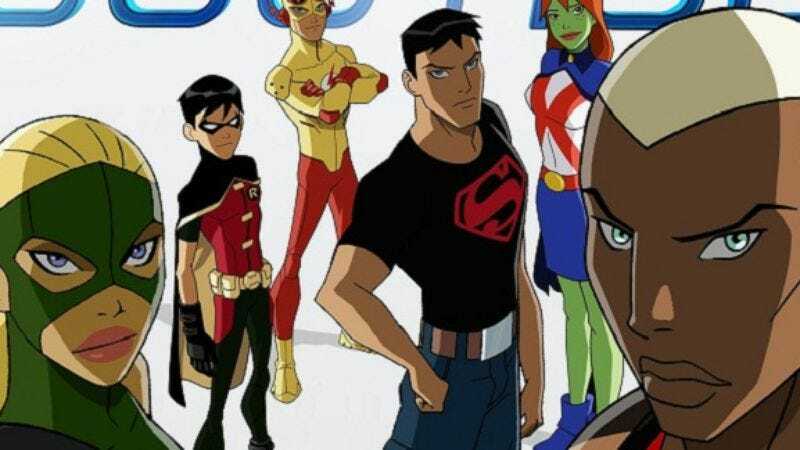 Young Justice, scheduled to begin airing regularly on Cartoon Network in January 2011, is an above-average animated series that's worth watching as is, although I hope future episodes will find the balance between plotting and clever characterization that was the hallmark of the best DCAU offerings. Every time someone said "sidekick" I couldn't help thinking of Bruce Campbell shouting "SIIIDEKICK!" in Sky High. For the sake of clarity/continuity: Young Justice is not part of the DCAU. It is partly based on the comic book of the same name, although it's not a direct adaptation. Wikipedia claims that the series is set on Earth-16. You don't really need to know any of this in order to enjoy the show. The writing can be clichéd and melodramatic at times: Robin, reaching the end of a zip line: "I'm at the end of my rope." Kid Flash: "We're in too deep—literally." Because they're, like, underground. Get it? Aqualad has cool-looking gills. He also doesn't wear shoes, which is probably not a tribute to Bea Arthur nor an indication that he is a fan of Joss Stone, although I can't think of a better reason. "Why isn't anyone ever just whelmed?" "No, Speedy is Green Arrow's sidekick." "That makes no sense at all." "You're not a real boy, you're a weapon! Now get back to your pod!" The Hall of Justice is in Washington, D.C. I never noticed that before. There are a lot of characters thrown into the mix and it's not clear how much we'll be seeing of them in future episodes. One strange addition is Zatara; in most DC stories the magical superhero role is filled by his daughter Zatanna. Guardian, not exactly an A-lister, plays a big role, and we see two Green Lanterns, John Stewart and Hal Jordan. When the League members are scanned at the Hall of Justice, each one has a number. Does anyone know what that means?